The right music can set the stage for romance. Fortunately for me and Fort Smith, Arkansas, the thriving bluegrass scene has gotten my blood flowing. 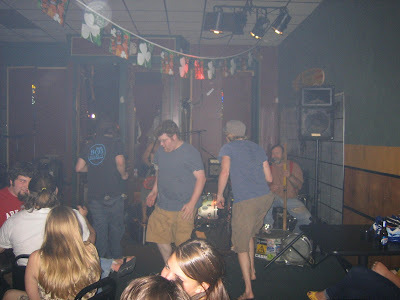 Take for example The Ben Miller Band from Joplin, Missouri. I stumbled upon them at a bar in downtown Fort Smith. I was a bit stunned to see a shirtless man playing a washboard, a bearded man playing a washtub bass (a broom handle attached to a metal basin) and a wailing singer on the slide guitar. But they soon had my ears tickled and my toes tapping. The three dancing fellows below were feeling it as well. Look to the far right to see the washtub bass. A driving mixture of bluegrass, zydeco, blues, hip hop and good old-fashioned jamming, the band calls their sound Ozark Stomp. (The Ozarks are a mountain range spanning Arkansas, Missouri, Kansas and Oklahoma.) How much did we dig it? Well, let’s just say three live CDs were purchased from Mr. Miller on the way out. More surprising, though, was my appreciation for Hank Williams III. A local slipped us his Straight to Hell CD with no small amount of religious fervor. I was expecting country, of course, but country it is not. Called “hellbilly” by some, “honky punk” by others, Hank the Third, as he’s affectionately called, is an unclassifiable renegade. Irreverent, aggressive, hard-drinking and hilarious, he’s got a spirited defiance that goes over quite well in these parts. Who knew Fort Smith would be a musical education? I find it remarkable that almost every bar has live music four or more nights a week. Music is not just a soundtrack here. It’s a way of life.